Without decisive action, global temperatures could rise by at least four degrees Celsius (seven degrees Fahrenheit) by the end of the century. A new World Bank report says that such a world would be “so different from the current one” that it would be difficult to even anticipate the challenges we would face. The report has garnered a great deal of press coverage, in part because of its stark language and in part because of the institution that issued it. “The fact that the World Bank – an entity committed to free market capitalism – has weighed in on the threat of climate change and the urgency of acting to combat it, puts the nail in the coffin of that claim,” prominent climate researcher Michael Mann told LiveScience, referencing continued skepticism about climate change solutions from some. The World Bank focuses on a “four degree world” scenario because of its potentially devastating effects and is fairly probable, even if moderate action is taken. According to the Intergovernmental Panel on Climate Change, there’s a 20 percent likelihood of a four degree warmer world by 2100 if all current climate pledges are met, and a 40 percent chance if these pledges go unfulfilled. A two degree Celsius increase is deemed essentially inescapable at this point. Some parts of a four degree world will be unrecognizable, the report says. By 2080-2100, for example, the coolest months in the tropics will be “substantially warmer” than the warmest months today. Such warming means that 12 to 39 percent of the planet will be experiencing a “novel climate,” or a climate system that doesn’t exist today. Some regions will experience more drought, others greater rainfall. Species will be forced to migrate to cooler climates, either at higher latitudes or higher elevations. But some species won’t be able to move quickly enough, and others will have nowhere to go; as their numbers dwindle, biodiversity will suffer. Between 43 and 50 percent of the world’s population will live in water scarce areas (compared to 28 percent today), which has serious ramifications for agriculture, sanitation, and health. Vector-borne diseases like malaria which are spread by mosquitoes that thrive in warm environments will be more prevalent, and increased malnutrition as warmer temperatures and changed precipitation patterns will drive lower agricultural yields in some areas. Ocean acidification will very likely have a serious effect on organisms like coral and mollusks (clams, mussels, etc.) by preventing them from properly forming their skeletons. The combination of significant acidification and warming could mean that coral reefs not only fail to grow but actually begin to dissolve. The report notes that there have been no studies projecting the exact consequences of the collapse of the coral reef system, but since they provide about one-fourth of the fish catch in developing countries, feeding a billion people in Asia alone, their loss would no doubt be deeply felt. Some aspects of the report call attention to underreported areas, like the potential for climate change to impact mental health and lifestyles. Others challenge long-held assumptions. For example, many climate change studies project increased agricultural production as warmer temperatures lead to a longer growing season in high latitudes and higher concentrations of carbon dioxide increases photosynthesis in plants, a process known as carbon fertilization. But the World Bank notes that carbon fertilization is dependent on other factors like the nutritional content of the soil, changes in precipitation patterns, and optimal growing temperature of the crop, and warns that even with carbon fertilization, tropical countries will experience decreased yields. And some high latitude regions that might have benefited from a longer growing season, including the United States and southern Europe, will experience more frequent droughts which will decrease productivity, potentially off-setting any gains. Measuring the impact of climate change is notoriously difficult, and the report emphasizes that its effects cannot always be separated from other dynamics in our changing world. One of these elements is population growth, which is primarily occurring in the low-latitude countries that will experience the brunt of climate change’s adverse effects. In these countries, even as more people and higher standards of living create a demand for more resources, the effects of a four degree world will decrease resources available as agricultural yields decline and water scarcity increases. In other countries, like China and India, population growth is leveling off but more people are moving to the middle class, which also increases demand for natural resources both domestically and globally. In a 2°C world, relatively small runoff changes combined with large population growth over the next few decades mean that changes in water stress would mostly be dominated by population changes, not climate changes… However, in a 4°C world, climate changes would become large enough to dominate changes in water stress in many cases. There’s a great deal of uncertainty in future population projections as well, tied to the degree to which health infrastructure expands to meet existing family planning needs for women around the world. So those outcomes also play a (unacknowledged) role in the World Bank’s scenario. Urbanization, another aspect of population dynamics, exposes greater numbers of people to the risks associated with climate change. “Because of high population densities and often inadequate urban planning, coastal cities in developing regions are particularly vulnerable to sea-level rise in concert with other impacts of climate change,” the authors write. Urban populations are also more likely to experience higher temperatures and poorer sanitation; a four degree world could exacerbate both situations with rising temperatures and changing rainfall patterns. Even in such a data-conscious report (the bibliography is 12 pages long), much remains uncertain – the authors are, after all, making projections up to 90 years from now and trying to understand an unprecedented rate of temperature change. Further, “many systems and changes in the extremes have much more impact than changes in the mean,” the report notes. Ecosystems like the Amazon rainforest and coral reefs around the world could collapse rapidly, non-linearly, and unpredictably after a certain threshold is reached. Similarly, the West Antarctic and Greenland Ice Sheets could reach a tipping point leading to “irreversible decay,” even if warming slows or is reversed. If these ice sheets melt, sea levels could rise one meter (three feet) by 2100, or even as high as two meters, and contribute to rising sea levels for centuries. 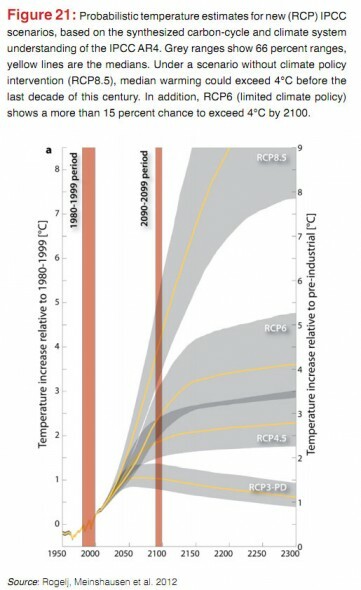 “Given that uncertainty remains about the full nature and scale of impacts, there is also no certainty that adaptation to a 4°C world is possible,” the authors conclude. This is a remarkable statement from the World Bank about a scenario that is not implausible: There is no certainty that adaptation is possible. Collected together, the report paints a stark picture of a four degree world. While it is perhaps not as shocking as DARA’s latest Climate Vulnerability Monitor, such a dramatic warning from the World Bank is notable. Sources: CNN, The Economic Times, LiveScience, World Bank. 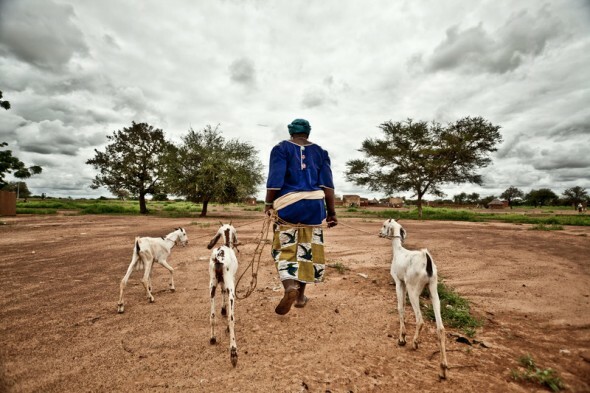 Photo credit: At the Mentao Nord camp in Burkina Faso, courtesy of Oxfam International; chart courtesy of the World Bank.